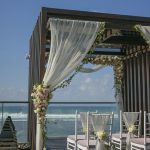 From stunning Majestic Chapel, to enchanted tropical gardens and glorious sandy beachfront, The Ritz-Carlton Bali abounds with beautiful venues and breathtaking views that create a magical setting for the wedding of your dreams. Those with an intimate ceremony in mind can elevate their ceremony, literally, with an exclusive Sky Wedding, An inspired option for up to eight guests, our fabulously-appointed Sky Villas have a top floor location and exquisite panorama, so you can exchange vows with bird’s eye views over the sparkling Indian Ocean.Your highly personalized Sky Wedding includes a private butler, and the services of our highly talented event planners to ensure your wedding is everything you have ever hoped for. A fragrant fresh flower walkway, flower shower, violin music, Champagne wedding toast and signature Ritz-Carlton wedding cake all add to the enchantment.“Our Sky Weddings are truly unique, giving you the opportunity to celebrate the most special day of your life in the most sublime setting with those nearest and dearest,” says Karim Tayach, General Manager of The Ritz-Carlton, Bali. Sky Wedding includes a romantic two-night stay in a sensational 2-bedroomed Sky Villa with Private Pool equipped with private gazebo with endless ocean views from every corner. What better way to start your married life together than indulging in the height of luxury, with King-size bed sheathed in customized linens, seamless indoor outdoor living, private infinity pool and oversized soaking tubs. If you can bear to tear yourselves away, there is also the option to upgrade to club level with access to all the superb facilities of The Ritz-Carlton Club. A fabulous array of pre and post wedding activities can also be arranged for couples and their guests, from traditional soul purification rituals to indulgent spa and beauty treatments, exciting island excursions, sunset soirees or wedding breakfast on the cliffs. 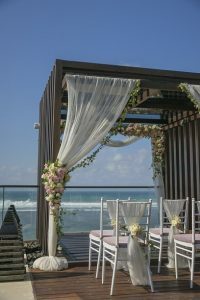 The Ritz-Carlton, Bali specializes in creating memories to last a lifetime, choosing a Sky Wedding will ensure that the most important day of your life is absolutely unforgettable.